Front group king Rick Berman, who has worked in the shadows for years, is starting to draw closer scrutiny from the IRS, the media and the public for the unique, self-dealing business model he developed to champion for big business. Berman, a former lobbyist, set up six nonprofit organizations with innocuous names like the Center for Consumer Freedom, the American Beverage Institute and the Employment Policies Institute. Despite their nonprofit designation, together these groups provide as much as 70 percent of the revenues of his for-profit enterprise, Berman and Company. The Center for Consumer Freedom, for example, took in $1.5 million in revenues in 2008, of which 93 percent went to Berman and his firm. The American Beverage Institute took in $1.7 million, of which 82 percent went to Berman and his firm. None of his non-profit groups have independent offices or staff, and all of them pay Berman's for-profit business for services like accounting, copying, writing, operating Web sites, placing opinion-editorials, and bookkeeping, which is managed by Berman's wife, Dixie Lynn Berman. Rick Berman sits on the boards of his organizations, holds a total of 24 positions within them, and he serves as Executive Director for most of them. Sounds fishy, right? Berman's signature method of operation is to discredit the messenger rather than address the message head on. Recently, in true form, he has been attacking the Humane Society of the United States by trying to convince the public that the organization "wants to force us all to be vegetarians or vegans." Why would Berman, or anyone, want to attack the Humane Society, let alone with such an implausible claim? Because the Society has had an ongoing campaign to achieve better living conditions for livestock, which, if it came to fruition, could cost agribusiness millions. The campaign has no doubt brought the Humane Society to the attention of agribusiness, restaurant chains and other animal-unfriendly business enterprises which are likely funding Berman's attacks on the organization. The Humane Society, though, to its credit, has refused to passively take Berman's attacks. In response, the organization has been working to publicize Berman's self-dealing business set up, with some success. On June 17, the New York Times published a front-page expose' of Berman's operation. What happened next? 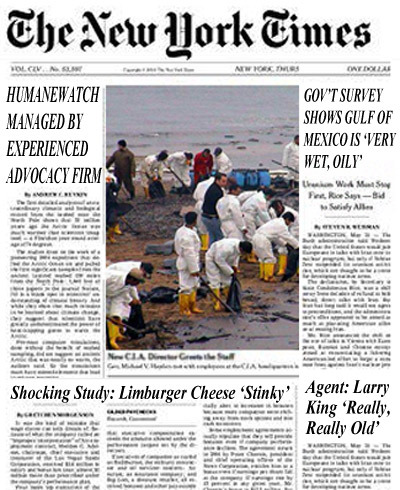 True to style, Berman attacked the New York Times by posting a bizarre and ridiculous mock-up of the Times on a Website attacking the Humane Society. So who is funding Berman's attacks on the Humane Society and other organizations? That's the big, fat secret. Berman formerly lobbied for the very same industries that now support his nonprofits. That's probably no coincidence. Berman found a way to continue lobbying for the same clients, while serving their interests even more closely. He just had to change his business model, and a little terminology. His business model essentially labels corporate lobbying funds as "donations," and then launders the money through nonprofit "educational" groups. An official U.S. government non-profit designation permits him keep his funders' names secret, so we don't know who he works for (although we can hazard a pretty good guess). Through these "donations" to "nonprofits," Berman mounts vicious attacks on groups that advocate policies that could negatively affect big business. His business model keeps businesses from being connected back to the vicious attacks, which could be bad for business. Jack Reilly, a former IRS attorney, says the case can be made that Berman establishes nonprofit groups for the purpose of funneling business to his for-profit firm, a self-dealing activity that makes his overall enterprise commercial in nature, not "non-profit." Now, after decades of abusing the concept and intent of a government non-profit status, Berman's operations are finally drawing closer scrutiny from the IRS, the New York Times, the public and the organizations he attacks. If we keep up the pressure, perhaps even more transparency will lie in Rick Berman's future -- like exposure of the businesses who fund him. Corporate Front Group, American Council on Science and Health, Smears List of Its Enemies as "Deniers for Hire"
It looks to me like some people will go to great lengths to abuse the systems put in place for the betterment of all of us. Good for the IRS to go after them. Maybe others will be less likely to succeed in the future. I couldn't agree more. It's amazing how people will forsake all morals and any sense of decency just to make money. It makes me worry for the future since it seems to get worse every year. Many people do not know that the AKC is involved with Rick Berman, because the AKC makes the majority of its income from puppy mill registrations, and supports puppy mill cruelty for profit. https://www.sourcewatch.org/index.php?title=American_Kennel_Club The AKC also has a business relationship with Petland, the largest purveyor of puppy mill puppies, and a Berman client. The AKC, of course, detests humane groups that push for regulation of puppy mills and anti-cruelty laws. Without the puppy mills, the AKC would go bankrupt instead of raking in millions and millions for huge salaries, dog shows, breeder promotion, and lobbying.. AKC board member Patti Strand, responsible for a large amount of the AKC's puppy mill business and on the AKC Large Volume Breeder (puppy mill) committee, has herself a front group, NAIA, that works with Berman and Center for Consumer Freedom smearing humane groups.and passing out Berman propaganda. https://www.sourcewatch.org/index.php?title=Patti_Strand This is why you will often see AKC breeders posting propaganda from Rick Berman on websites, comments, letters to media, etc. Some AKC breeders have even infiltrated smaller shelters, and use the cover of the shelter to issue Rick Berman propaganda against humane groups. You will also see many of the AKC state and national breed clubs sending money to Rick Berman ally NAIA, and reproducing Rick Berman propaganda from their clubs in their literature, in contacts to the media, their lobbying activity with their legislators, etc while posing as "show breeders" or experts in dog care, all the while simply lobbying for puppy mill protection and opposing regulation via Rick Berman propaganda. Some of these AKC breeders have also infiltrated local animal control advisory boards and citizen groups, where they use Rick Berman propaganda to oppose regulation and oppose anti-cruelty laws on behalf of themselves, their industry, and their lobbyist Rick Berman and the puppy mills. Some breeders have formed front groups that they call "Responsible Dog Owner" groups to do Rick Berman lobbying for the puppy mills, etc. They try to trick the public with the "responsible dog owner" line that hides their for-profit business interests. This is how Berman attempts to control. He gets the "little people" to do his work for him locally. Rick Berman should become more creatinv when talking about for/non rofit. Anyway, great post. Super article on a serious problem! This people who are using non-profit organizations as front for them to profit must be letigated. And even more front groups! Would be orgs like Patti Strand's NAIA "org" - and probably money from some of her Akc supporters - or hunters, animal research testing, horse slaughterers, and other numerous blood sport/activity supporters. Or all of the above. Strand sat on the Akc's "High Volume Breeders Committee" which was created by Akc for their (ahem) "high volume" breeders - you can fill in the blanks on what people normally refer to those kind of "farms" as. I've read numerous articles about how the Akc is losing money - due to them partnering up with these "high volume" breeders - most reputable breeders, and people, want nothing to do with puppy mills - plus the general public isn't as ignorant as they once were about "coveting" a so called "pure breed" dog - we all know now that a rescue mutt is THE best breed out there. And folks that worship those worthless dog registration papers are too full of vanity to see beyond their noses. I'd check those sources first - and go from there. But I am guessing that journey won't take you too far from the NAIA's doorstep.